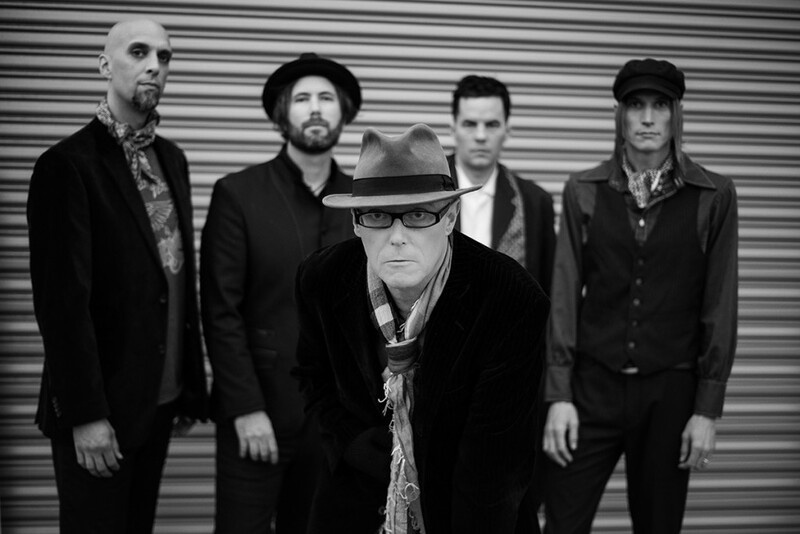 David J and The Gentleman Thieves will release their debut single “Gentrification Blues” via Starry Records on April 22nd. The protest song calls out the soul-sucking influx of corporate affluence into urban neighborhoods, which are often the lifeblood of artistic communities. 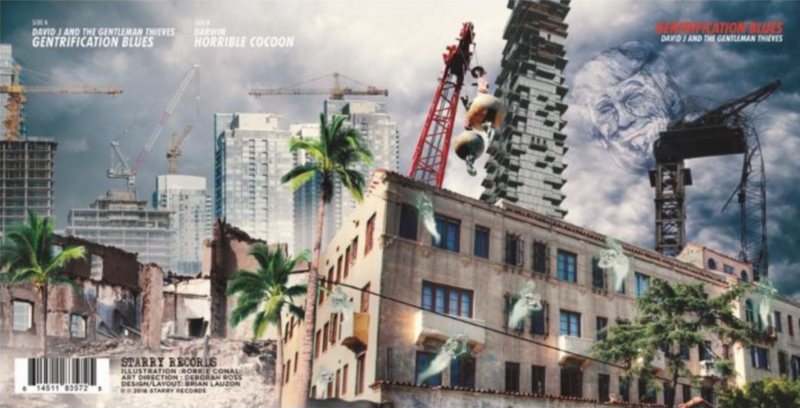 The split single, which includes the haunting, ethereal track “Horrible Cocoon” by Darwin as the b-side, features appropriately unflattering, Donald Trump-themed cover art by legendary satirical street poster artist Robbie Conal. Both tracks were produced by the artists themselves along with noted producers Brian Liesegang (NIN, Filter, Billy Corgan) and Kerry Brown (Smashing Pumpkins, Ziggy Marley, Courtney Love, Miley Cyrus). “‘Gentrification Blues’ is a new track that addresses the downside of avaricious gentrification. A Damoclean sword that looms over present day Bohemia,” explains David J. “It has already fallen in New York City, San Francisco, Paris, London and beyond, decimating artistic communities which simply cannot afford to survive let alone thrive as in former golden days. Formed amidst the swirling psychedelic prairie dust of The Desert Stars Festival in Joshua Tree in 2013, The Gentleman Thieves is the first full on, down and dirty rock n’ roll band that Bauhaus / Love and Rockets founding member, David J has fronted since the twin shooting stars of his former highly influential bands burned out a decade ago. In 1986, angered by the Reagan Administration’s rabid abuse of political power in the name of representative democracy, he began making satirical oil portraits of politicians and bureaucrats and turning them into street posters. He gradually developed an irregular guerrilla army of volunteers, who helped him poster the streets of major cities around the country. Over the past 24 years, Conal has made more than 80 street posters satirizing politicians from both political parties, televangelists and global capitalists. He has also taken on subjects like censorship, war, social injustice, and environmental issues. Conal is considered one of the country’s foremost satirical street poster artists. His work has been featured on “CBS This Morning”, “Charlie Rose” and in Time, Newsweek, The New York Times, the LA Times, The Wall Street Journal, Vanity Fair, People Magazine, Interview, and the Washington Post-which dubbed him, “America’s foremost street artist”. He’s received a National Endowment for the Arts Individual Artist Grant, a Getty Individual Artist Grant and a Los Angeles Cultural Affairs Individual Artist’s Grant (COLA).